Add to these stats the fact that the price of cocaine in the U.S. is at an all time low, and purity is supposedly unaffected. The product being sprayed in Colombia is Monsanto's Roundup, which reportedly has harmful affects on human reproduction, including an increase in premature births and miscarriages. 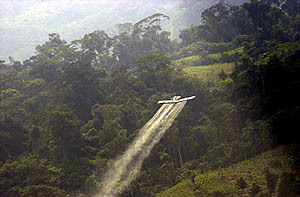 Plus, aerial fumigation not only kills the coca plants, but most other plants that it comes in contact with, affecting not only the coca plants, but the natural and human environments around them as well. It appears that Plan Colombia as a success story, as Uribe and Bush recently claimed, is questionable at best. As an added note, in the above linked article, Bush says that "America will continue to stand with the people of Colombia." I wonder if he knows there are three different groups warring in Colombia, and they are all composed of Colombians. I wonder which group Bush is referring to? Well, obviously the ones that do exactly as America says, which happen to be the ones that have received the $4 Billion over the last 5 years.